I really wish I'd had cable way back when and was interested in Star Trek when it was popular. I feel so tragically out of date. I recently finished watching TNG, and I'm so very sad that I have to move on to Voyager. 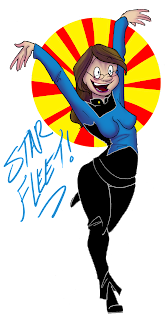 I've been meaning to draw Star Trek art for a while, but for the time being, this is the closest I'll get. 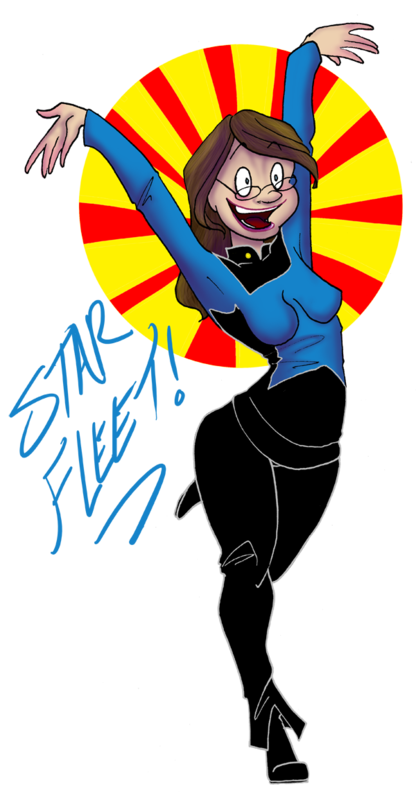 I thought about t really hard, but I'd never get into Star Fleet Academy to begin with. I picked the blue uniform, figuring if I was anywhere other than art, I could see myself being a nurse. Well no, not seriously, because I don't think I could handle the pressure or the pain of being with people who are sick or in pain- But I mean I think I could learn it. So! Even though I'd love the idea of being an engineer, Science always escaped me, I'll have to settle for medical. Or maybe even command *scratches chin*. Nah, no one listens to me. Today was another rough day-- I played in the snow for a couple of hours with Winona, Leah and Neilizza, and it was a lot of fun, but I came home, and Swazzle was struggling. I curled up with her and sat with her for a while. Offered her an apple, some cheese and a half eaten potato. Less than an hour later, Swazzle had a heart attack in Sarah's hands and died. I wasn't there to say goodbye- she was just.. gone. We were going to take her to the vet tomorrow to get put down because she was in pain- but this was sudden an unexpected and I'm broken. I feel like Elmer just died, and now I've had Swazzle taken from me. I haven't been much of a mom- I rescued her and bought her and then passed her off to Sarah to care for while I helped pay. I was the estranged parent who never visited enough, and I feel like a jerk for being so broken up when I didn't even treat her right. Swazzle and Archie are both waiting for me on the other side- but I've got a long way to go before I catch up. I'm afraid to go to sleep again, I don't want to lay awake crying. Bye baby <3 I loved you so much, even if I didn't show it enough.